Toy Dynamic Strength (2m/s) Tester, to determine whether a toy after dynamic strength test produces hazardous sharp edges, hazardous sharp points, hazard of crushing the fingers or other parts of the body. A load 25kg or 50kg is secured to the toy, and articulated arms with the elbow joints in a downward position are attached to the steering wheel or handlebars if the toy is so equipped. The toy is driven three times into a 50 x 50mm non-resilient step. 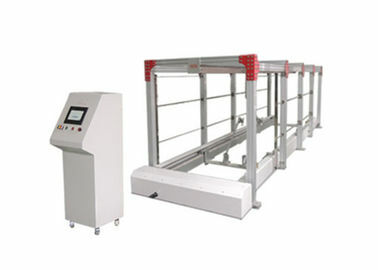 Note: this tester can conform to but not limit to the standards above, for more standards conformance, please contact us.